Amazing savings prepared just for you at U.S. carter's stores and online. It is possible to receive discounts up to 50% from original prices, throughout the store + save even more with printable coupon. This coupon allows you to receive 25% discount on your purchase of $40 or more, or you can receive 15% discount on your entire purchase (no minimum spending required). The offer is valid until September 5, 2016. Source of the information is carter's. 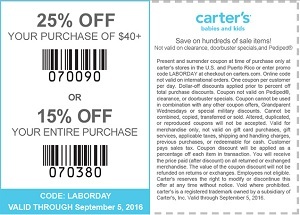 For more details visit U.S. carter's store location or carter's online.